These days I get a lot of make money online related websites to blog about. Well, to tell the truth, these days you can receive money for doing almost everything on the Internet. Lets just think about it, every single one of us uses forums and social communities every day and we know how to write about communicate on the web, so this means we can get money for creating content. Let me prove this, you can monetize your writing skills with one of the websites, which are listed in the “Earn By Blogging And Writing” category at IncomeBooster.org (basically this is where I list all websites, which allow us to make money by writing and producing content). But just now I have mentioned social websites and community forums. Right now there is just another great web2.0 project, which enables you to earn money with free Internet auctions. The site is called Fribiz.com and it has been reviewed on this blog already (please refer to “Fribiz.com Review – Make Money Online and Receive Free Prizes for Using New Paid Social Network“). Well, I have been using these free web auctions for several weeks now and I am pretty amazed with everything they have to offer. The whole idea, which stands behind this Fribiz website is pretty awesome. You just have to be active on their website, participate in various contests, bid in virtual items and get chances to receive free stuff (well, you earn your points, and then bid on items you like, just like ebay, but for free and prizes are real). 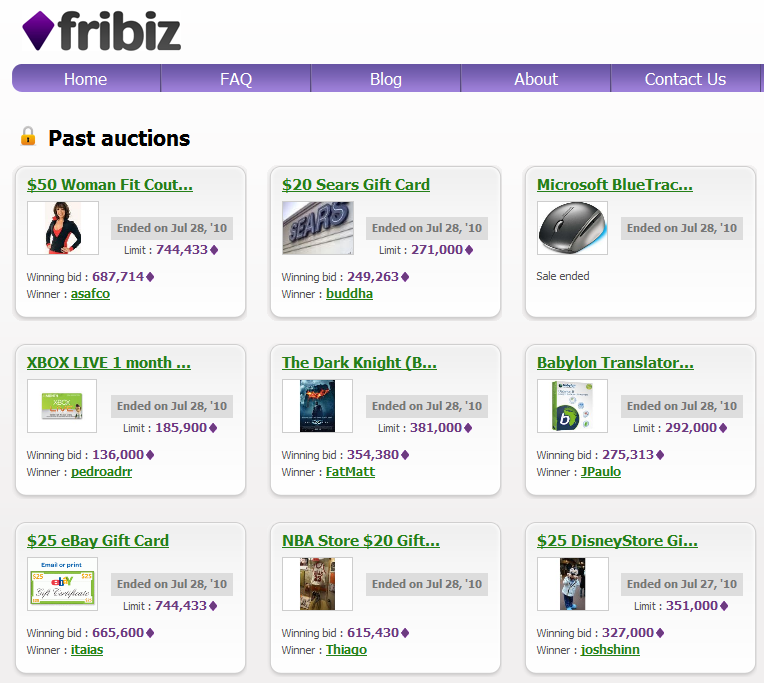 As far I have not spent a lot of time using Fribiz.com yet, but I really want to get my first prize (I was pretty close to getting my first prize, but I was outbid). Here you can get all possible items for free here is just some examples. find out more about Fribiz.com and get updates about possible prizes from Fribiz.com. And many more. You just have to register to see the full list of available prizes, it is pretty cool and you get 10000 points just for registering. I see that people are blogging about this one pretty rapidly and youtube videos with people unwrapping prizes from Fribiz.com are getting more common. So don’t loose your chance and start getting your prizes just for being you (by being active at Fribiz.com). I have free invite waiting for you and registration takes just several seconds. Thanks for reading my blog, don’t forget to subscribe – it is totally free. I have received my another payment from LetitBit.net, so I will be blogging more about get paid to upload websites pretty soon, so hold on for updates and don’t forget to leave your questions.